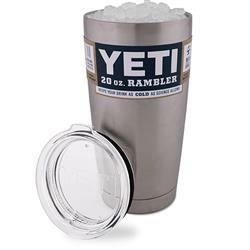 YETI Rambler 20 oz. 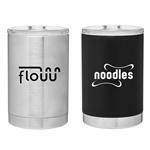 Tumbler and Travel Mug custom imprinted.With this mug, your beverages will stay ice cold or piping hot longer. The Yeti double-wall vacuum insulated tumbler features an 18/8 stainless steel body, which means your drink still keeps its temperature no matter how much of a beating this cup takes. The YETI Rambler tumblers are BPA-free and have a No Sweat™ Design to make sure your hands stay dry, and are dishwasher-safe. They come standard with the YETI MagSlider Lid that is shatter resistant and is the only drink lid that harnesses the power of magnets to keep your sodas or suds on lock! Great on the go gift for executives, holidays and conventions! You will be on trend with this custom YETI Rambler tumbler. Outside 6 7/8” × 3 1/2”- Empty weight 12.7 oz.